AIRCELL 7 is a 7mm (.287″OD) low loss extra flexible cable that is excellent for HF operation and is usable well up into the microwave region. Aircell 7 begins with a flexible stranded center conductor which is surrounded by gas injected PE foam for low loss. 100% shielding is achieved through the use of both coated copper foil and copper braid. A tough outer jacket of UV protected PVC completes its construction. A full complement of connectors are available for AIRCELL 7 including: BNC, TYPE-N, and PL259. 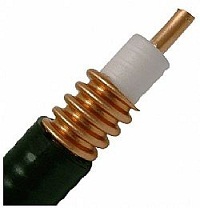 Aircom PLUS is a 50 ohm coaxial cable with excellent electric and mechanical properties. Its low loss characteristics make it very suitable for VHF, UHF and SHF applications. It has an elastic exterior PVC coating and, in looks and diameter, is similar to RG213. This is where the similarity ends. Its loss characteristics Vs. frequency outperform RG213 quite significatly, in fact it perform closely to heliax cables at VHF and UHF frequencies. A hight quality N-plug has been developed for AIRCOM PLUS. Its design features a 3 micron gold plated interior pin, nickel plated exterior, waterproof construction and operation up to 10 GHz. Also N-female, BNC, TNC and UHF Connectors are available for AIRCOM PLUS. CELLFLEX® is a range of low-attenuation transmission line cables for high performance applications within the telecommunications sector. installations and others. These cables are ideally suited for the demands of professional radio and TV stations, WLAN, 3M GSM networks, WLAN and extra-long transmission line runs. Available in all major sizes of 1/2 inch, 5/8 inch, 7/8in, 1-1/4in, 1-5/8in and 2-1/4in, ask for a quote, if you need unlisted type. Constructed of a closed-cell polyethylene dielectric and welded-seam solid copper conductors, these cables have passed rigorous testing and meet exacting performance specifications. They are available in standard polyethylene or flame-retardant polyethylene jacket materials, and with premium VSWR levels in several telecommunication bands. The designers of CELF400 have designed a sturdy cable with a very thick flexible core. An alloy with a layer of copper and an extremely well-shielded conductive outer jacket. The conductive outer shell consists of two parts. First a layer of high quality aluminum foil over it and put a dense copper braid jacket which in turn is tinned, all for maximum conductivity and 100% EMC protection. The cable is dismantled with a firm and elastic UV protected Black PVC jacket. Unlike other coaxial cables which changes the impedance when the cable bends the CELF400 sit inside a solid structure in the cable that keeps the distance between the screen and the same cable. CELF400 firm structure padding ensures that has changed place of the center guide impossible. As a result, it is able to be used in pipes, telescopes, and rotating equipment without loss of signal strength. The padding also provides a solid shield around the conductor, making it protects against moisture and corrosion. ECOFLEX® 10, is an extremely flexible and cushioning poor 50 ohm coaxial cable for the range of 0 to 4GHz. It consists of PE-LLC dialectrium what care carries a low attenuation value at which the flexible coaxial cable ensure new standards.By using a unique construktie has This cable is a good result in both damping and mechanical. Ecoflex-10 is suitable for all applications, it is low-loss, highly flexible, low irradiation (> 85dB at 3GHz). ECOFLEX® 15, is a 15mm low loss flexible cable which is ideal from shortwave to microwave (6 GHz) applications. It has a 7-conductor copper core which is surrounded by a PE foam. The shield is made from a copper film has been around a copper pairs. The PVC outer jacket is UV resistant and therefore suitable for permanent outdoor installation. The cable is designed for professional use and meets the strictest quality standards. He has a shield> 90 dB at 1 GHz.